1 cup white chocolate chips (optional) TIP: If you used an 11 ounce bag of chocolate chips you can just use the remaining chips. 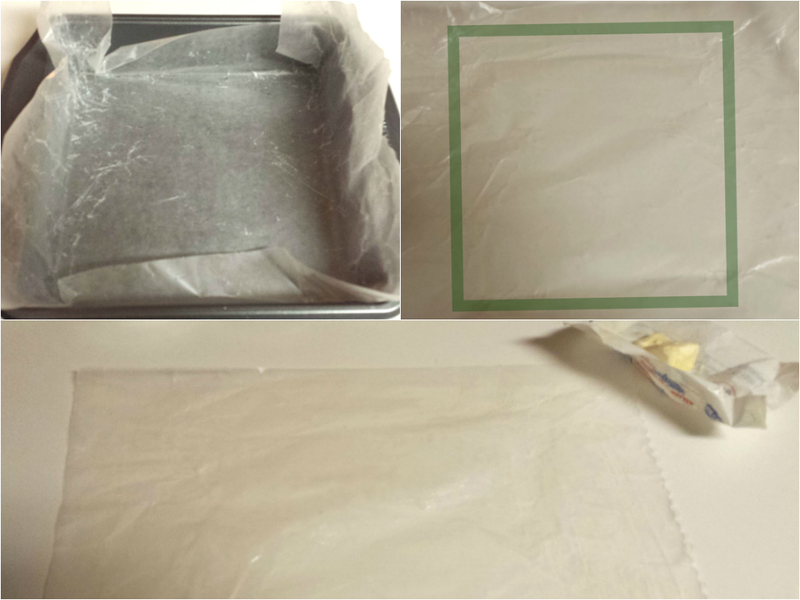 The first thing you want to do is line a 9″ square baking pan with greased wax paper. After you tear a piece that fits into your pan, place the paper in the pan to get the shape. This way when you go to grease the paper you have an idea of where to place the butter. NOTE: I used a separate piece of butter from what I used to melt the chocolate to grease the paper. Don’t let melting the chocolate intimidate you. All you need is some patience. Fill a medium sauce pot with about an inch of water. Medium low heat should be sufficient, but you can start with medium. Let the water heat up for about 5-8 minutes. If it starts to bubble turn your heat down. You don’t want boiling water for this. Once you have this regulated, place a metal mixing bowl over your pot. The water should not touch whatever bowl you use. You can use glass if you like. TIP: This way helps you to see if your water starts to boil. Melt your butter first. Once it’s fully melted you can begin adding your chocolate in small palm fulls. Let the chocolate melt until there are very few lumps in between adding chocolate. After you’ve added it all, remove your bowl from the heat and melt the last few lumps. Set the bowl aside. 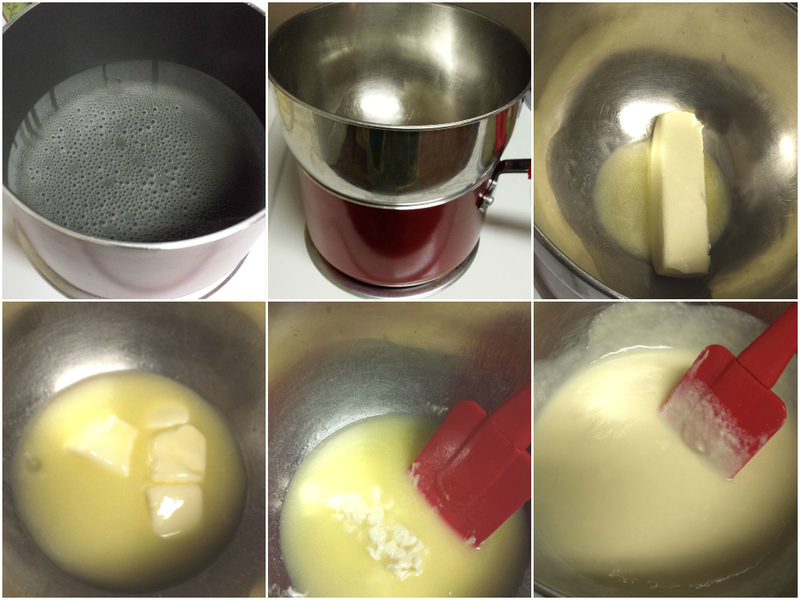 In a separate bowl, beat two eggs until they are foamy. Superb arm strength is helpful but not required. Next add the sugar and vanilla. Slowly add the chocolate and butter mixture. NOTE: Mixture will thicken so you may have to fold in the chocolate towards the end with a spatula. Next fold in the salt and flour. If you opted to use the chocolate chips here is where you would add them. TIP: Do you like nuts? Go ahead and preheat your oven to 350 degrees. Pour the mixture into the sauce pan. While it settles into place, heat up your raspberry jam. NOTE: Jams and jellies get very hot, especially around the edges, so heat it up in 30 second increments until the consistency is easy to scoop and/or pour stirring in between. 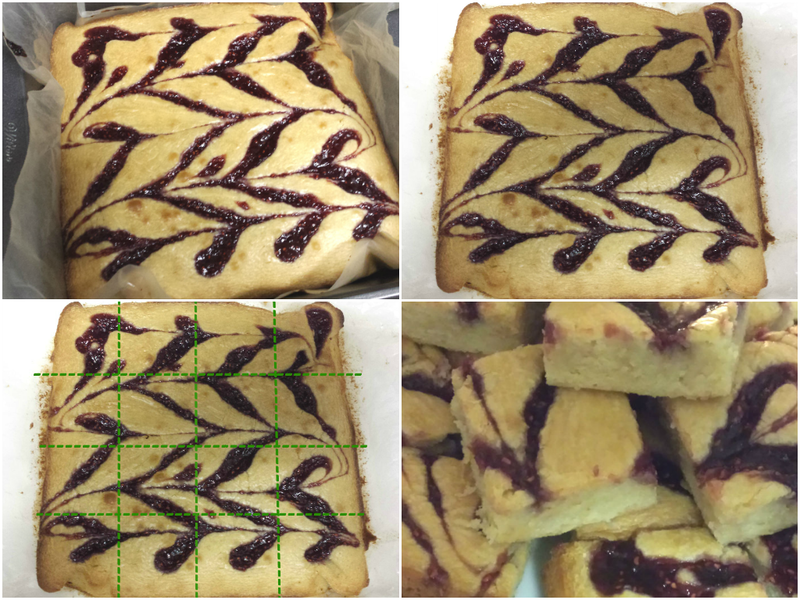 Here you can get a bit creative with how you lay out your jam and how you choose to swirl it. All you need is a spoon (more control) to place the jam over the mixture and a knife or toothpick to drag through the jam. Here I used simple straight lines and dragged my knife across perpendicular to my jam lines. Place the blondie mixture into the oven for 25 minutes. 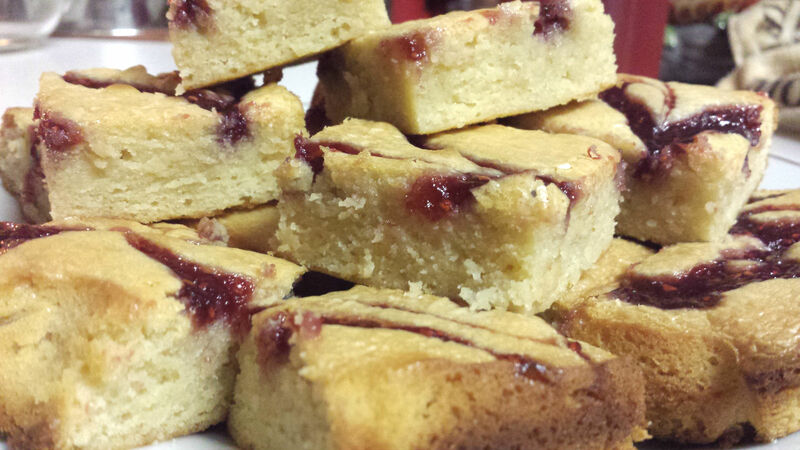 You can let your blondies cool to room temperature or you can serve them hot. The wax paper makes it easy to remove the blondies from the pan and clean up is a breeze. Here they’re cut into 16 squares. TIP: Cookie cutters are lots of fun. Now it’s time to eat! 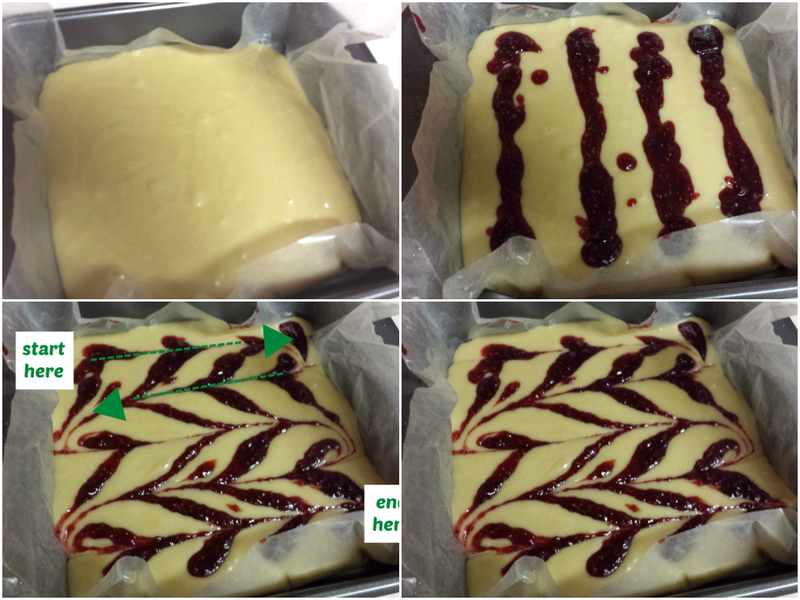 Please tag me in a picture of your finished blondies on Twitter and Instagram @EmeraldLilyCS. I’d love to see the swirl pattern you came up with. Also, like my Facebook page and watch me on YouTube @Emerald Lily Craft Studio. I still have one bag of chocolate chips left. Any suggestions on how to use them? 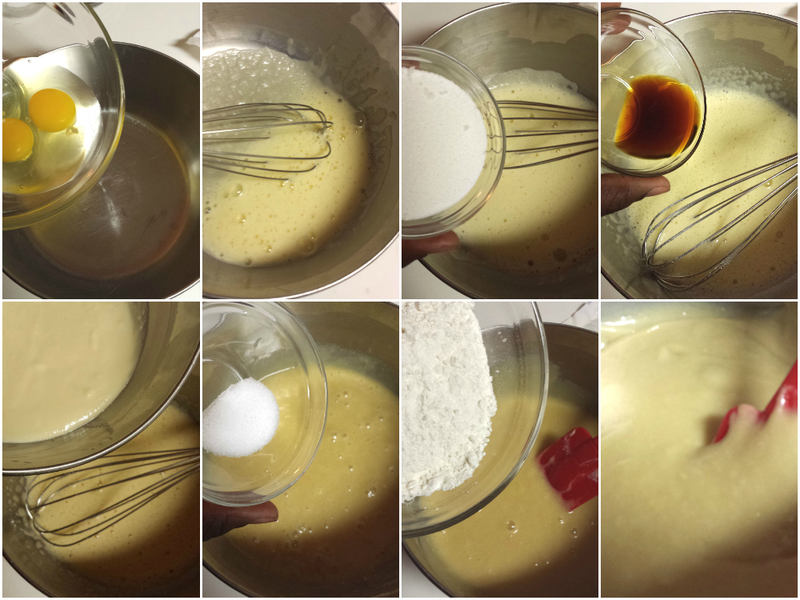 This entry was posted in Food and tagged baking, blondie, blondies, cooking, raspberry, recipe, sweets, tutorial, white chocolate. Bookmark the permalink.